When I first decided to start this blog, I knew that nutrition would be a big part of it. I try to share healthy recipes with everyone, but I also try to keep them vegetarian friendly. If possible, I include substitutions for vegan diets as well. However, I am not a vegetarian. 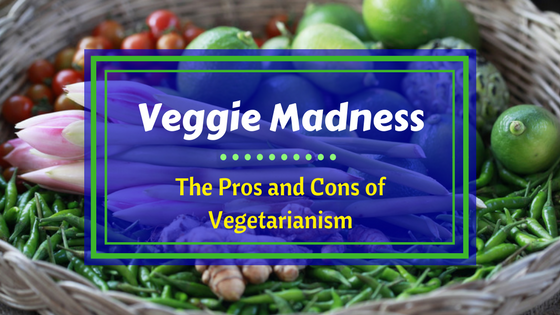 I get asked about vegetarianism a lot, and I think I can cook some really good vegan dishes. However, I choose to continue to consume meat. However, since I get asked about these diets so often, I decided that I'd give everyone a basic introduction to them, and talk about the health benefits as well as the negative health effects of these diets. The term “vegetarian” is really a fairly broad term. 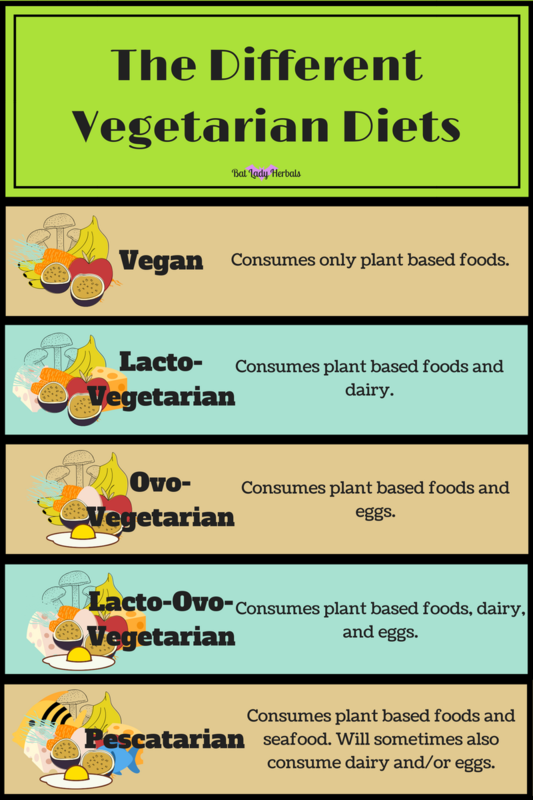 When most people talk about vegetarians or vegetarianism, they're typically talking about either lacto-ovo-vegetarianism or veganism. But what's the difference? This is the most common question I get asked, so here's a quick breakdown of the different types of vegetarianism. Vegans, also called strict vegetarians, only consume plant based foods. They don't consume animal products at all. No meat, dairy, eggs, gelatin, or even honey. Some vegans also choose to not purchase animal based clothing or other items. Lacto-Vegetarians consume plant based foods with dairy. These vegetarians tend to consume more animal products like honey and gelatin as well. Ovo-Vegetarians consume plant based foods with eggs. These vegetarians may not mind eating eggs, but they tend to prefer unfertilized eggs or only free range. They may or may not decide to consume honey and/or gelatin as well. 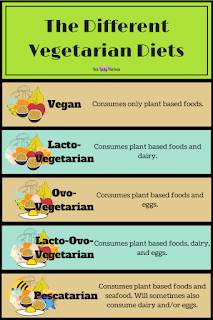 Lacto-Ovo-Vegetarians consume plant based foods along with eggs and dairy. They are most likely to consume honey, gelatin, and other animal products that are not meat. While technically not a vegetarian, pescatarians stick to a mostly vegetarian diet, with seafood added in. Some consume dairy and/or eggs, but most of them don't mind consuming other animal products such as honey and gelatin. 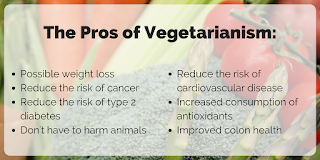 There are quite a number of benefits of moving towards a plant based, or vegetarian, diet. Not all of them are health focused. One of the more common reasons to choose this diet has a lot to do with philosophy and ethics. I am also just listing the most common benefits, there are other benefits that are not listed here. When you first change any diet, there may be a little bloating and digestive distress. 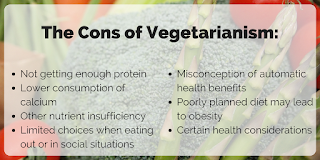 However, if you have a healthy diet and make sure to consume enough of all the necessary nutrients, a vegetarian diet can certainly help you loose weight. 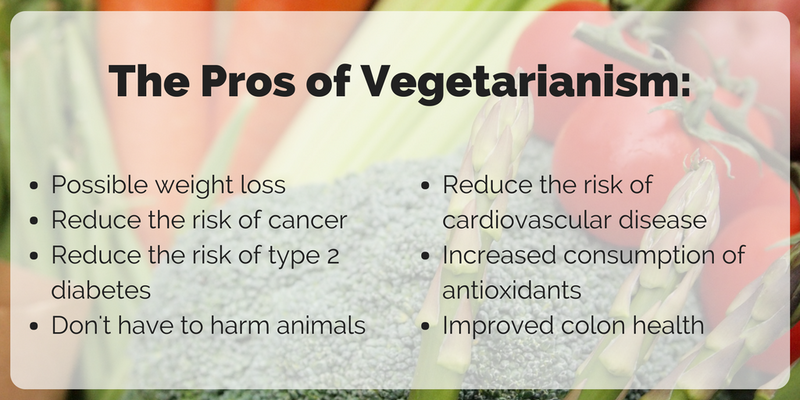 Scientific studies have shown that vegetarians have about a 40% lower chance of developing certain cancers. This is largely attributed to the increase of vegetable and fruit consumption in vegetarians. Fruits and vegetables help boost the immune system. When you remove meat from the diet, you remove a large percentage of the fats as well. This helps to lower the risk for developing heart disease. Just don't forget to supplement with healthy, plant-based fats, and plenty of potassium, so that you keep your cardiovascular system running right. Increasing consumption of whole grains, fruits, and vegetables helps to improve glycemic control and reduce the risk of developing type 2 diabetes. Consuming high levels of meat is also associated with an increased risk of developing type 3 diabetes. Vegetables and fruits contain high amounts of fiber. Not only does fiber help rid your body of excessive cholesterol, and help improve bowel movements. It also helps to feed the beneficial bacteria in your gut which leads to quite a few other health benefits. In a properly planned vegetarian meal, you can easily receive all the necessary nutrients for every day function. However fruits and vegetables are loaded with antioxidants, vitamins, and minerals. So increasing your consumption of plant based foods can increase your consumption of those nutrients. Unethical farming practices are a serious concern. There are quite a few farms that have moved away from most of the worst ones, but certain meats and meat products are more commonly found to be raised with these unethical standards. Cutting out meat from your diet helps to reduce our dependence on these standards. While the benefits of changing your diet to be plant based are numerous, there are certain risks. When you don't properly plan your meals, you run a large risk of not consuming enough proteins. But along with the proteins, you also need all the essential amino acids for proper cellular function. Most plant based foods do not have a few of these amino acids. Your body also does not store amino acids, so you need to make sure you are consuming them every day. When you don't consume enough of them, you can develop certain health issues over time. The first symptom of this is muscle wasting. When you don't get enough amino acids in your diet, you body starts breaking down muscle tissue in order to get the amino acids it needs. After this, you can begin to see symptoms such as fatigue, decreased immune response, changes to the texture of your skin and hair, and higher levels of anxiety and stress. Meat and dairy are the best sources for calcium, iron, and quite a few other necessary minerals. When you don't consume enough of these minerals, your body starts taking them from your bones which can lead to brittle bones and/or osteoporosis. Even if you are consuming plants high in these minerals, you may not be getting enough. Minerals from dairy and meat are more bioavailable (easily absorbed and used by the human body) than those from vegetables and fruit. There are a number of nutrients that are not easily found in the plant world. Vegetarians that are not careful with meal planning may run the risk of developing B12 insufficiency, for example. Many people are under the misconception that removing meat from their diets and food automatically makes them healthy. This is not true. You can choose to not eat meat and still have a very unhealthy diet. Macaroni and cheese is vegetarian, so is cheese pizza. Living off these two meals will run you a higher risk of developing health conditions later on. There are also quite a few other popular “junk” foods out there that are vegan (oreos are a great example of this), this does not mean it's healthy. There is also a misconception that vegetarians live longer. This is not necessarily true. People who have a healthy vegetarian lifestyle tend to be more health conscious. Health conscious people tend to live longer. When changing your diet in any way, you should properly prepare and plan for those changes. Make sure that you are consuming all of the proper nutrients you need, in the proper amounts. Combine your meals well and continue to make healthy choices. When you choose to be vegetarian with a string of poorly planned meals, you are still making unhealthy choices. You can increase your risk of developing type 2 diabetes, heart disease, cancer, etc instead of reducing it. You also could be reducing your ability to function on a day to day basis. Poor diets (vegetarian or otherwise) lead to chronic fatigue, malnutrition, osteoporosis, muscle pain, depression, anxiety, etc. Eat mindfully and you'll be healthy and able to survive the daily rigors of life. There are certain health conditions that limit what you can and cannot eat. I have encountered people who cannot properly process plant protein and have to consume either fish or meat. I have also encountered people who cannot consume meat for various reasons. It's important that when you change your diet, you keep in close contact with a health professional who can help you determine if your changes are good for your or not. I am lucky enough to live in Orlando, FL where there are lots of options for vegetarians. However, many people do not live in areas like this. 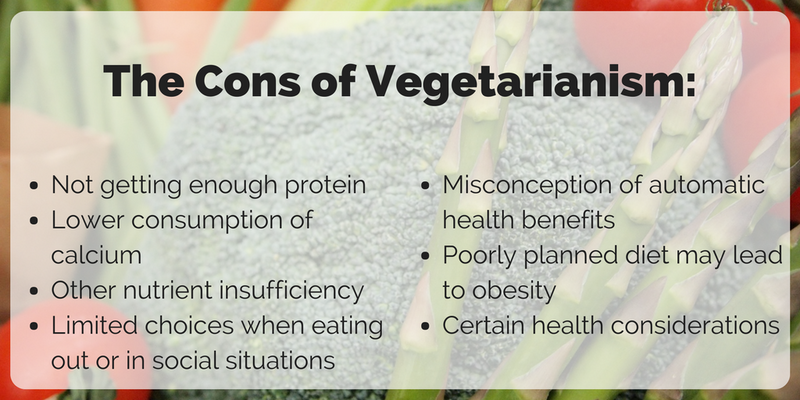 It's important to realize that becoming a vegetarian may make it hard to eat at restaurants and parties. It may make social situations slightly awkward by having to explain your limitations. I hope this entry has helped clarify differences between the types of vegetarianism and made you aware of the possible health risks. If you have any questions or comments, please leave them below!